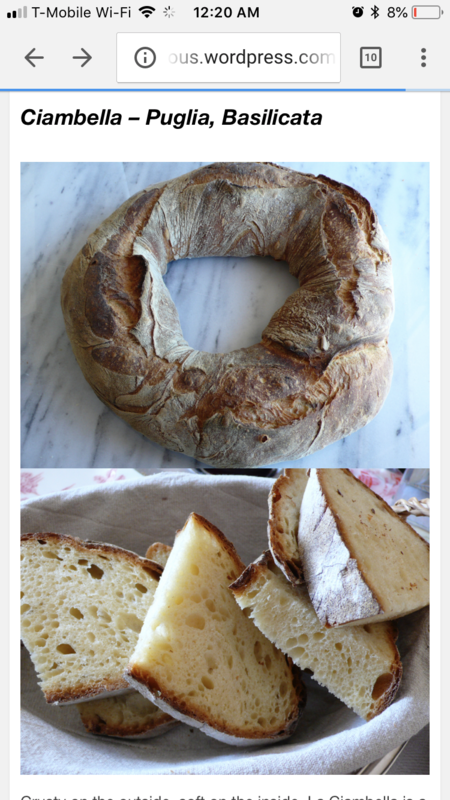 I was looking up the various region breads of Italy and came across photos of what the blog “Italicious” called Ciambella – Puglia, Basilicata. Photo included below. It just looked so beautiful and tasty that I knew I wanted to bake it. However, she. I google the above name, I get wildly different results. Is anyone one familiar with this bread and could send me a recipe or point me in a more specific direction? So I looked around and found this recipe. I found that the name also refers to sweet products like coffee cakes and doughnuts, and leavened breads in that shape also. Ciambella -This ring-shaped bread had a formidable crust but a soft crumb, and is made in Puglia and Basilicata. Here is a recipe for a Pugliese bread, however they do not show it baked in a ring,which I'm sure would be easy to make.